A favorite color right now--umm--I don't know what this blue is called, but I usually go back to it. You can't see in the photo very well, but I put clear acrylic squares on top of the cupcakes, Making Memories calls them page pebbles. 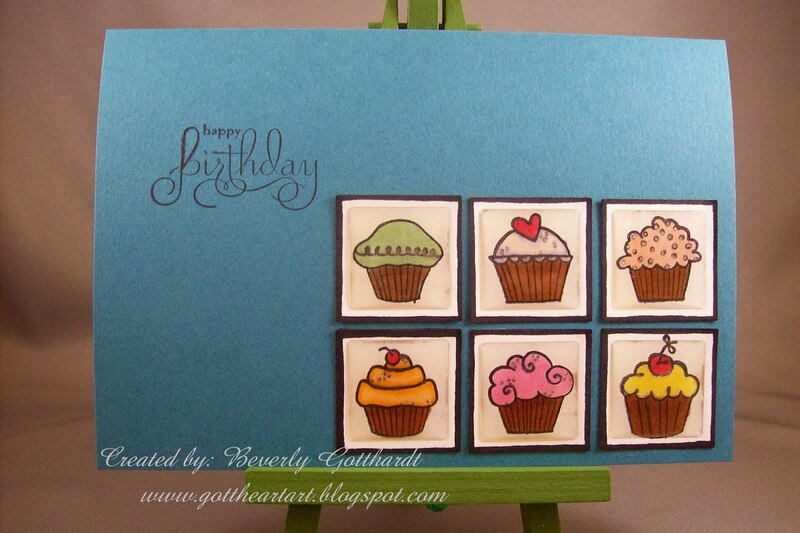 Fussy and Fancy Friday Challenge Challenge 9: Birthday w/a Sweet Treat! Supplies: Blue Card Bland 5" X 6 1/2" unknown, Paper: Stampin Up-Whisper White, Stamps: Studio G-VC0004 Series 27, Stampin Up-Well Scripted, Yummy, Ink: Ranger Archival Ink-Jet Black,Copic markers, Sakura Gelly Roll Pen-Clear Star, Making Memories-page pebbles. This is adorable! I love all those cupcakes and I agree that blue is beautiful. Thanks so much for playing along with my sketch challenge! Cute cupcake layout and that is a beautiful shade of blue! Thanks so much for joining us at Raise The Bar! Awesome creation! 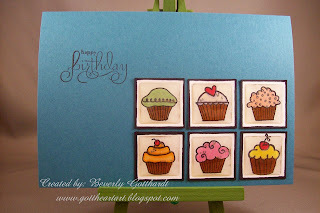 Gorgeous card, love the cute cupcakes! Thank you for joining us at Fussy and Fancy Friday! wow, yummy cupcakes! your card looks delicious! you should have enter our last challenge with the cupcake theme.